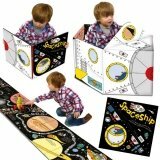 Convertible Spaceship can be used as a story book, large play mat and be transformed into a sit-in spaceship toy. This multiuse convertible book engages preschool kids with its exciting story and 'out of this world' illustrations. Features of Convertible Spaceship: • Read a short story with your child about a space mission to reach an alien spacecraft – you'll have to dodge comets, explosions and steer past the path of other planets as you go. • The illustrated story route allows kids to follow and interact with the story on the large play mat, designed like our Universe, using their own toys. • The fun, simple text encourages word recognition and early reading skills, helps them to learn what astronauts experience in space and about the awesome Solar System. • The sit-in toy allows kids to pretend to leave Earth and blast off into space.